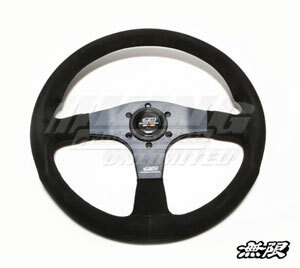 Mugen Racing III Steering Wheel 53100-XG8-K1S0 - King Motorsports Unlimited, Inc.
Mugen's Newest Steering Wheel is now Back in Stock!! This 350mm steering wheel is covered in the finest suede leather available and includes a newly designed horn button. Mugen or Momo Steering Wheel Hub Adapters Sold Separately.